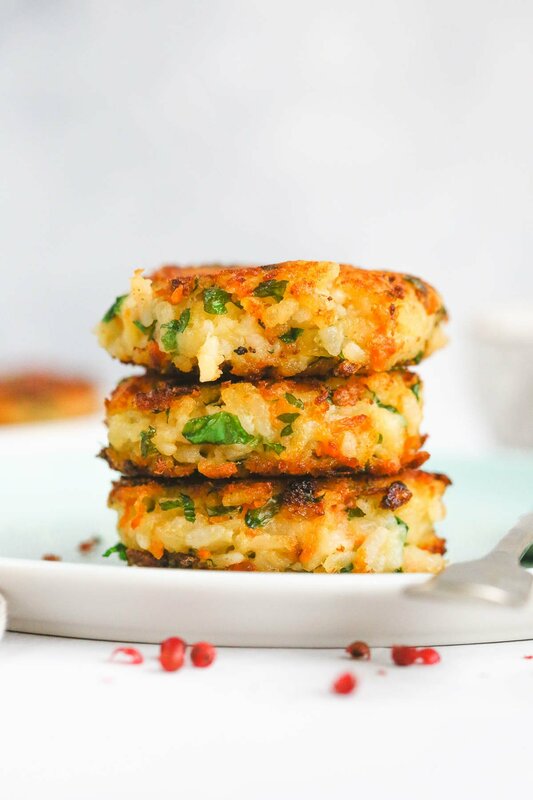 Vegan potato cakes made with leftover mashed potatoes, rice, carrots, onions and parsley! These potato cakes are crispy and lovely from the outside, but super soft from the inside. They are so easy to make, and the kids love them. Naturally gluten-free, and suitable for toddlers. Also great for freezing and make ahead meals. I grew up eating potato cakes. My Mum always made different variations of potato cakes (maybe that’s a Russian thing? ), and our whole family really loved them. I shared my Mum’s cheesy potato cakes recipe on the blog a couple of years ago, and as so many of my readers loved the recipe I thought that it’s time to share a different variation that I really love. 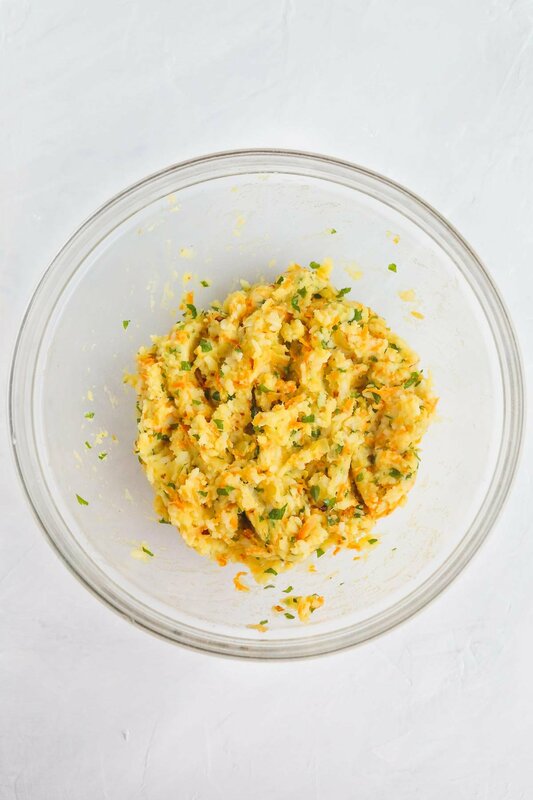 This recipe is eggless, vegan, gluten-free, uses more vegetables and will also save the leftover mashed potatoes that you don’t know what to do with from being thrown out. The cheesy potato cakes recipe uses an egg to help bind the mashed potatoes to create dense cakes (can be subbed with flax egg), it also calls for some starch or flour. However, this recipe is totally vegan and gluten-free! We add rice and some veggies for that extra flavour. 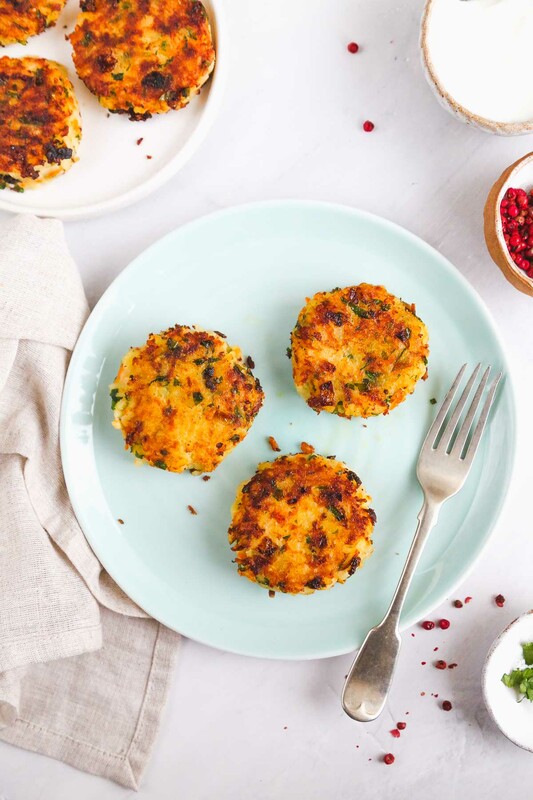 We don’t normally use any spices to make these vegan potato cakes but feel free to do so especially if you’re not cooking for really young children. After you mix the ingredients together in a mixing bowl, shape the mixture into small patties. If you’re finding it difficult to shape patties because the mixture is too soft, pop in the fridge for 15-20 minutes and then work with it. Shape the patties, and shallow fry them in a frying pan until they’re golden and crispy. Serve warm. If you’re boiling potatoes to make these potato fritters or cakes, use a potato ricer or masher to mash them and make sure that there are no lumps left. Fully cook the rice before adding it to the mixture. Make patties that are not too big. Big patties start to break and won’t easily cook through. You could add different herbs to the patties, I’ve added parsley this time but I also add dill or chives sometimes. When shallow frying the potato cakes, fry on medium heat until the patties start to crisp as the crispy exterior is what’s so special about these potato fritters. Whether you are making these for yourself or for your family includig young children, I hope that you love them as much as we do! These potato cakes are crispy and lovely from the outside, but super soft from the inside. Super easy to make! Boil peeled potatoes until soft, and mash them. Saute onions and carrots until they're soft. 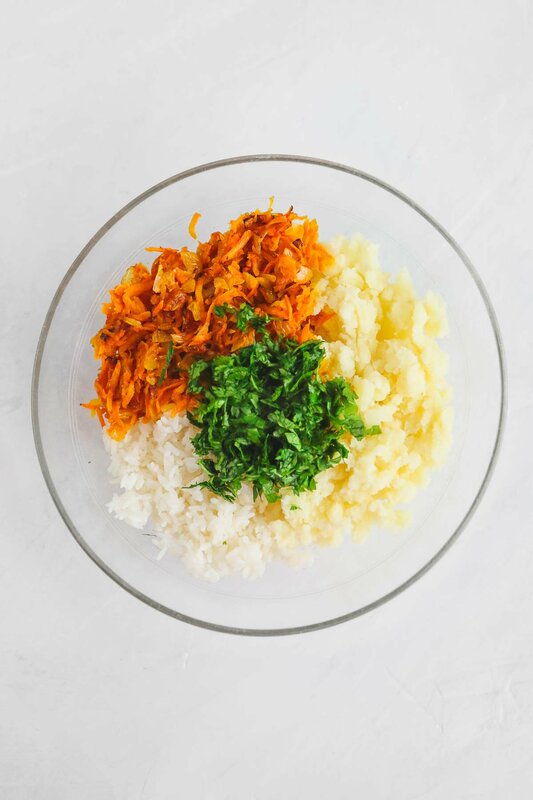 In a bowl combine the mashed potatoes with the cooked rice, sauteed carrots and onions, parsley and season with salt to taste. Divide the mixture into 14-16 portions and shape balls then flatten into cakes using your hands. Fry in vegetable oil until the cakes are golden and crispy (the mixture will be very soft so be careful not to break the cakes while frying). Serve hot. 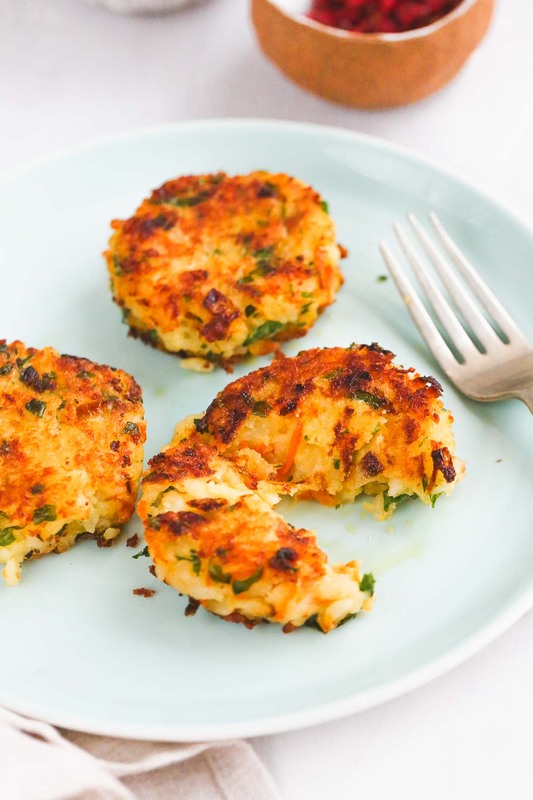 I love this twist – I love potato cakes and looking forward to trying out this version. These look delicious, I am going to try them out! I usually have leftover mashed potatoes thrown in the bin. Finally, a good way to take advantage of them! These look so tasty! I grew up eating potato cakes too, it’s such a great way to use up any leftover mash potato. I love this version, will definitely try this. These look yummy and delicious. The flavors are amazing. Love the Crispiness too. Potatoes are always so yummy in any form. The Potato cakes looks so flavorful and yummy!! I love potato cakes and most recipes seem to have breadcrumbs, so I’m happy to find this one. My son is GF and will gobble these up! And they’re so perfectly crisped! YUM!